Common Name : Embelia, False Black Pepper And Flase Pepper. Part Used : Berries, Leaves And Root-bark. Habitat : Present throughout india, in area upto 1,500 m in hilly regions. Uses : Embelia root bark is acrid, astringent, anthelmintic, antifertility, antioestrogenic, carminative, digestive, laxative, soothing, stimulant, stomachic, and thermogenic. It is effective against intestinal parasites and intestinal worms. It is used in abdominal disorders, skin fungal infections, flatulence, constipation, indigestion, headache, hemorrhoids, lung diseases, obesity, piles, pneumonia, mouth ulcers, toothache and sore throat. Its decoction is useful in insanity and heart diseases. Leaves are astringent, thermogenic, demulcent and depurative in nature. 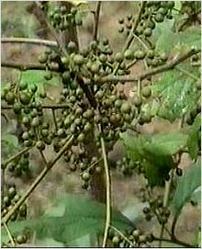 It is useful in skin diseases and leprosy. Fruits are acrid, astringent, anthelmintic, bitter, brain tonic, carminative, contraceptive, diuretic, febrifuge, laxative, stimulant, and thermogenic. It is useful in skin diseases, leprosy, nervous debility, dyspepsia, flatulence, colic, tumors, asthma, fever, ascaris infestation and general debility. Paste is being used for mouth wash and avoiding cavities. It is being also used in skin related problems. Decoction of the roots is given in insanity and heart diseases.